On this trip you can reach the archaeological complex of Choquequirao, considered as an Inca citadel of Machu Picchu's sister because of its importance and location. Going through several small towns such as Limatambo, which still retains vestiges of the Inca and colonial times; Cachora is the starting point of the trek and the towns of Chiquisca and Marampata, good places to camp. The residents of this area still maintain some customs and ancient traditions. Throughout this trek will appreciate Guardian Mountains, fertile valleys and the Apurimac Canyon and of course discover the cultural and historical value of Choquequirao. 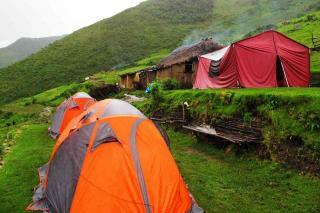 4 days of intense adventure full of beautiful landscapes one after the other to stay in your memory. Early in the morning, we pick you up from your hotel in Cusco and we go by bus to the town of San Pedro de Cachora (2800m), where you will have free time for breakfast. Here we find the rest of our travel team (cooks, porters and horses). Here we began the trek by an average of 7-8 hours. On the road you can see a great diversity of landscapes belonging to different climates, such as the snowy Pedrayoc, diversity of flora and fauna embellish our journey. Then we come to the viewpoint of Capulichayoc, where we can observe the Apurimac canyon and from this point we will begin to descend until our camp in Chiqisca (1800m), where we camp tonight. 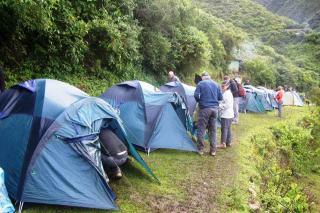 After a good breakfast, we start our way for aproximatly 5 hours up to Choquequirao. Stop for lunch at Marcapata and then time to explore with your guide all the archeological site of Choquequirao "golden cradle", located at 1 500m hung on the Apurímac. It covers over 8 hectares, where only one-third has been uncovered, the rest still under the lush vegetation typical of the area. Here we explore the three levels found, where we can appreciate houses, terraces, temples and overvieuws point from where with luck we can appreciate the flight of the Condor. Early morning, we can see the sun rise on the ruins and after a good breakfast we start to go down the same way to reach our camp site at Chiquisca. After a good rest, we begin our trek early to climb to Cachora for approximately 7 hours. 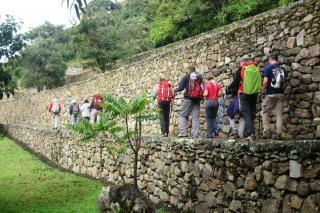 Here we expect our mobility that will bring us back to Cusco. Arrival at night. 3 breakfasts, 3 lunches, 3 dinners and various snacks to eat throughout the day. Cook. ( Vegetarian meal in option at no additional cost). 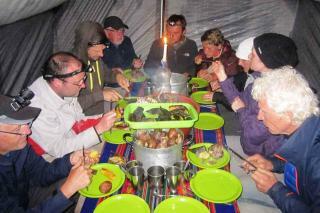 Double occupancy tents, mattress, dining tent, table and chairs. Vest wool to keep warm, hat and gloves. A Bottle of water or metal water container.